Are Fanuc lead times Killing You? Need a Drive Repaired in a Hurry? 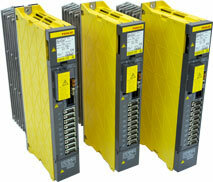 Fanuc servo drive repair has been successfully performed at Repair Zone for over 10 years on Thousands of Fanuc units. We have the parts inventory to back-up our complete expert repair. We finish it off with thorough testing on FANUC controls and servo motors, to form a full FANUC servo system! We also repair Fanuc spindle drives. Save hundreds, even thousands versus OEM. Call today to get the industry's fastest service! "Repair Zone saved us from excessive downtime. Our machine was running, but not at optimal speed. (OEM) Fanuc lead time was outrageous. The drive you sent us is running strong. Thanks!" Expert Fanuc Drive Repair, Everytime! Your 100% satisfaction is our guarantee - contact us for fast, cost-effective repair, today!